In this hilarious Southern folktale, mean old Boss Lion threatens the peaceful folk of Brer Village, and Brer Rabbit is forced to teach the carnivorous trouble-maker a lesson he’ll never forget. 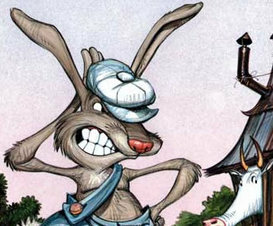 Brer Rabbit outsmarts the baddest fella in the forest—then saunters back to town as the local hero. This witty, playful adaptation, perfectly complemented by gritty bayou blues, is just the kind of fun your family will enjoy again and again.